Political parties are the weakest link in many democratic transitions around the world—frequently beset with persistent problems of self-interest, corruption, ideological incoherence, and narrow electoralism. Thomas Carothers draws on extensive field research to diagnose deficiencies in party aid, assess its overall impact, and offer practical ideas for doing better. Political parties are the weakest link in many democratic transitions around the world—frequently beset with persistent problems of self-interest, corruption, ideological incoherence, and narrow electoralism. A large and ever-growing number of U.S., European, and multilateral assistance programs seek to help parties become effective prodemocratic actors. But given the depth of the problems, is success possible? 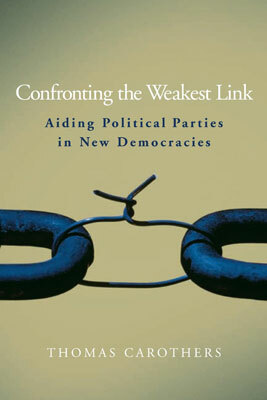 Confronting the Weakest Link is a pathbreaking study of international aid for political parties. Beginning with a penetrating analysis of party shortcomings in developing and postcommunist countries, Thomas Carothers draws on extensive field research to diagnose deficiencies in party aid, assess its overall impact, and offer practical ideas for doing better. This broad ranging analysis, which spans Latin America, Central and Eastern Europe, the former Soviet Union, Africa, the Middle East, and Asia, sheds invaluable light on a major element of the contemporary challenge of democracy-building, a subject now occupying center stage in the international policy arena. Thomas Carothers is vice president for international politics and governance at the Carnegie Endowment for International Peace and founder and director of the Endowment’s Democracy and Rule of Law Project. "Carothers brings an extremely detailed and informed perspective to the topic. Highly recommended." "This book is a required reading for all who deal with the assistance of parties and democracies, no matter if scientifically or practically." "Confronting the Weakest Link is the first systematic, independent assessment of the burgeoning field of international aid to political parties. Carothers’ masterful, searching account is critical and sobering, yet also sympathetic and constructive." "A timely, original study that illuminates not only international aid for political parties but also the dynamics of political party development generally. Carothers goes well beyond the standard laments and prescriptions about the troubled state of political parties in the world to offer new insights and approaches that will stir scholars and provoke practitioners."